New Online Software Xero Makes your Accounting Efficient – Saving you time and money! How you save time with Xero the beautiful software? New features like automatic bank feeds of your bank statements, The bank lines are straight in your accounting software you just code to account. Coding regular transactions the same every time for you, It picks up your regular transactions and codes them the same when they recur. Making it easy for BAS returns. Provides the framework for you to work better with your accountant to having a constant guide as to how much to keep aside for GST and Tax throughout the year. No limited Online users, access anywhere in the world on internet. Access to your accountant, no need to bring them your data file. They can work on your software file from their office and you can too from your computer. Invite in other users, controlling their access, like read only for financiers or auditors. Automatically backed up,infact forget backups of your accounting file on Xero. Integrate all your needs into the one software with Xero. Streamline Bank transactions, invoicing, reporting and employees all with the one software. Xero is constantly developing its software, spending millions on evolving the software as users suggest. New versions are automatically taken care of for you, you just have to login as normal. Great reporting, monthly reporting is easy. Make seeing your numbers in business fun again. Book-work more fun so it is more likely to get done. Having live current financial data will improve your business management. Just like a scoreboard at sport you need to now your current business scores. Saves time so you and your accountant can focus on more value adding activity such as strategy and marketing. We will implement and train you to use your new faster system or do it all for you. Meet us now on 83374460 to see just how easy it is to go online accounting and save time and money. More about choosing accounting software here. It is a shame for you not to have current financial information at your fingertips all year long, When this Software Does it so Easily! Find out how a new accounting software called Xero, made even an expert save time and money on accounting. We provide a range of Xero related services to get you started. We provide Set Up on Xero for new businesses and implementation and conversions for established businesses. We also provide one-on-one or small group training, help to work out how to get the most our of Xero, telephone support, seminars, Xero feasibility analysis, problem fixingand more. Is Xero right for me? If you are not sure whether Xero is right for you then we can analyse your needs and advise whether Xero is suitable for your business. We can work with you to decide if this is the right time for you to move to Xero. An absolute beginner to accounting may require 2 or more hours, whereas someone who is already familiar with an accounting system may only require 1 hour of training. Its that easy! The cost of getting set up on Xero will depend on the complexity of your data, whether you have your opening balances and whether you want to bring in historical data. Once we have spoken to you we can give you a quote tailored to your needs. For most clients we will be able to provide a fixed cost up front so you will know exactly what implementing Xero will cost you (and when you compare this cost to the saving you will make, you will see why Xero is such a great deal). Need an accountant who is Xero compatible? Romeo Caporaso and Maria Liu are a Xero-aware and accredited accountants. We have used Xero since 2009. Our accounting practice is now using Xero, and has formerly used Saasu and Myob. Romeo really helped me to understand Xero from scratch and also provided me with the background accounting knowledge to make sure I clearly understood the level of book keeping required for my small business. Rather than simply watching, Romeo encouraged me to practice using the different functions myself, which helped to ensure I could take what I learnt during the session and do it again at home. Romeo’s friendly and relaxed nature also ensured I felt comfortable to ask questions – however simple – during the session. 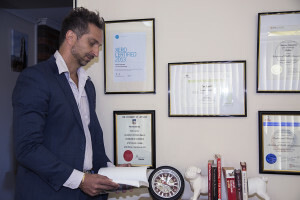 Romeo is a great teacher and I would recommend his services for anyone who needs a crash course in using Xero.